Welcome to Day #6 of Chocolate and Flowers Week, and Day #1 Chocolate and India Theme Week. The use of roses and other edible flowers has a long tradition. They were crystallized in the Victorian era when granulated sugar became more widely available. These candied flowers sat atop Victorian sponge cakes and other delicacies. The use of flowers in the U.S. declined about the time industrial food manufacturing processes started to offer quicker, cheaper, mass produced options and flavorings. However, a resurgence in interest in all things natural starting in the later 1900s, accelerated in the 2000s. 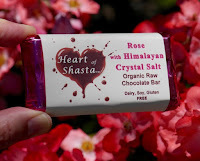 Today's Rose with Himalayan Crystal Salt Organic Raw Chocolate Bar from Heart of Shasta (Mt. Shasta, CA) was soft and fudgey in texture. This raw, organic bar was lightly sweetened with honey and contained a mild hint of rose (rose oil); and the sea salt was well incorporated and very subtle. This bar was dairy, soy and gluten free. India has a long tradition of using flowers (such as marigolds, roses and rose water, kevda (iris), kewra (pandanus), saffron, lotus) to flavor foods. While the closest connections to this bar and India might be the notion of rose flavoring and Himalayan salt, I'm looking forward to the coming week of chocolate blended with India-inspired spices and other ingredients. 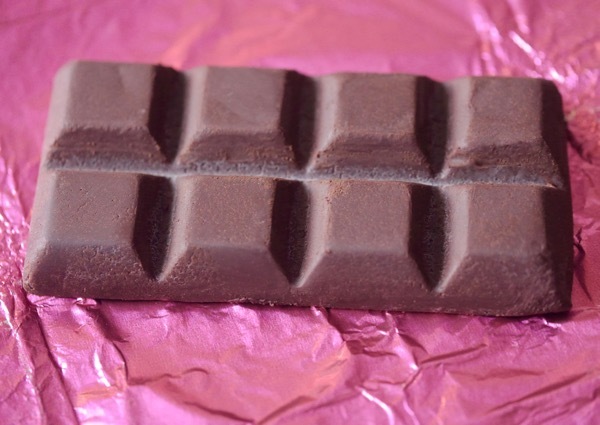 While chocolate isn't extremely popular in Indian desserts, the potential for fusions of Indian flavors, chocolate and gluten free sweets is undeniable.